This book of 15 short stories is for seasoned readers who enjoy the challenge of literary fiction in which grace prevails, though not quickly or easily. For starters, I recommend taking the time to read the book's introduction by James Vanden Bosch, which saves you from having to figure out that the male "narrator" in the stories (some are written in a first-person voice; others in third person) is "various narrators" who are nonetheless "recognizable versions of one basic narrator, a young man born in Hungary, raised as a Calvinist in a largely Catholic culture, who walked more or less innocently into the destructive energies of Eastern Europe in the 1930s." Though not all of the stories have the same characters, the narrative tone started on page 1 --- when the story's main character is aged 15, in 1936 --- is consistent enough throughout the book that by the last story --- when the main character is a grandfather immigrant to Florida, in the year 2000 --- you feel the satisfaction of having finished a novel. The stories progress more or less chronologically, from the Hungarian freedom-fighters resisting Czech annexation, through World War II and Nazi ruination, followed by the hard fist of Soviet occupation. Eventually the narration moves to England and then to Florida, always with flashbacks to the harsh setting --- the dangers, toils and snares --- of war-torn or occupied Hungary. 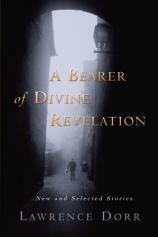 The most satisfying stories are the ones for which the book is named, "A Bearer of Divine Revelation" and "The Angel of His Presence." "Bearer" sets its narrator in Austria, after the War. He remembers a many- splendored childhood in Hungary. "By the time he was twenty-one, he was far away, sitting in a tank, half mad with fear and concentration, trying to survive. When he went home on leave, their house had been bombed to smithereens." Now in Salzburg, he has "sold his only item of value, the sheepskin lining of his coat." At a soup kitchen, a priest who appreciates his intellect and humility gives him a leather football --- which he promptly sells to a shoemaker --- and blesses him as a messenger of grace, "a bearer and announcer of the divine revelation." By the end of the story, begging food at another mission door, he eats bread: "crying and chewing at the same time, overcome by a terrible sadness, pity for God, who chose him and relied on him to be a bearer and announcer of the divine revelation." The last three stories of the book seem to have the same main character --- older in each --- who, by the end, is celebrating his fiftieth wedding anniversary in a town in England, where he gets lost, walking alone on back streets. "Then his nervous system captured him and took him away to a place he didn't want to go," back to Western Russia in the winter and War: a "small hamlet" that "had been burned down either by the Red Army to deny shelter to the enemy or by the Germans or one of their allies." Three days earlier "he had become the lone survivor of an explosion that instantly transformed him from a soldier [Axis] into a toy figurine . . ." He sought refuge in a hut, where he --- the enemy --- was taken in by a holy man and woman who shared their last loaf of bread with him. " 'Ungaro [Hungarian],' the old man said, 'how can we receive the Heavenly Bread if we don't give you earthly bread?' " Grace upon grace, the mysterious old man entrusted the young soldier to another Russian, commanding: "When it gets dark you will take him to where the other Ungaros are so he can go home." Only as an older man surrounded by his family, in a church celebrating his long marriage, can he understand the gift he had been given in that holy hut, the grace that called him to be a pilgrim named Christian.